One thing long-time vegans often forget is how hard it can be to be vegan in this society. I’ve forgotten to a large extent, because I’m married to a vegan, have a vegan daughter, and have literally thousands of vegan friends and colleagues. But if I think back to when I went vegan about two decades ago, I remember some of how hard it was. Not so much finding vegan food (although it was much harder then), but living in a non-vegan world. I had finally come to recognize the brutality that went on behind the scenes, but it seemed no one around me cared. Even worse than that, they mocked and attacked me for being vegan! I mean, not only did they support cruelty, but they ridiculed me for not eating animals! Of course, I had to show them: how ethical I was, how much cruelty I could purge from my life, how far I would go for the animals. Being vegan became my defining characteristic, and I became obsessed with justifying and glorifying veganism (and, thus, myself). Debates about language, philosophy, and hypotheticals all took on vital importance. I had to take part in any protest that came along: driving long distances, being out in sub-zero weather, getting arrested. I couldn’t “turn my back” on the animals. I was just that dedicated! I’m afraid that if my twenty-one-year-old self met my forty-one-year-old self, prior me would loathe current me. Young Matt would consider current Matt an intellectual coward, a pathetic sellout, a traitor to veganism. I fear there is nothing I could say to change my mind. I was so self-righteous, so angry, so obsessive. 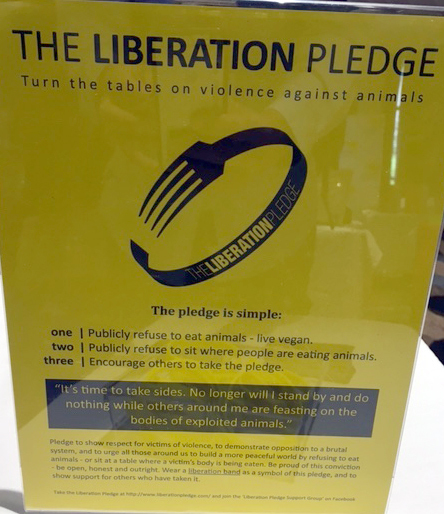 "Refuse to sit where people are eating animals." But, sometimes, I wonder what I would say, if I had the chance. The single most important lesson I’ve learned in the past twenty years is that the irreducible heart of what matters is suffering. Back then, even though I was absolutely sure I knew everything, I really didn’t know anything about suffering. Since then, though, I’ve developed a chronic disease and experienced times when I thought I was going to die, times when I wished I would die. Back then, I worried about abstractions and words and principles; I argued about exploitation, oppression, liberation. I didn’t take suffering seriously. Now, knowing what suffering really is, and knowing how much there is in the world, all my previous concerns seem, well . . . to put it kindly . . . ridiculous. I don’t know how I could convey this to my younger self, who had never really known suffering. Yet it seems clear to me now that when we make a decision, we should decide based on what leads to the least amount of suffering. This is the bottom line: that something is good and right and ethical if it causes less suffering than the alternatives. Obviously, Young Matt would crow, “Of course I make ethical choices, that is why I’m a vegan!” But here is what I couldn’t understand back then: what I put into my mouth is only a tiny fraction of what is important. Being surrounded by mocking meat eaters back then, I became obsessed over what I could control: my personal purity. It was only later I came to realize that, despite all my talk about “the animals,” I was really only protecting and promoting myself. It literally took me years to understand that there can be so much more to life than my own purity, my own righteousness. But things that seem painfully obvious to me now—like the fundamental, irreducible importance of suffering—never made it through my anger and self-absorption. As the saying goes, a smart person learns from their own mistakes, but a wise person learns from the mistakes of others. Another error I had to make for myself was the trap of “do something, do anything!” If there was some action going on “for the animals,” I had to do it. It never occurred to me to consider exactly what constructive purpose the action served, how much actual good was going to be accomplished, or what were the alternative uses of my time and resources. I thought only of showing my dedication, of expressing my outrage. But of course, expressions of outrage aren’t going to bring about animal liberation. I finally realized that if I really cared about something more than venting my anger, my actions had to be part of a reasoned, logical strategy. And the plan has to be realistic, not based simply on my desires, my demands of what “must” happen. This strategy has to be grounded in how the world actually is, learning from what history teaches us about how societies change, what psychology and sociology tell us about human nature, and what our capabilities are at the time. Understanding our capabilities is vital. We don’t have infinite resources; we actually have extremely limited time and money, especially compared to the industries that exploit animals. Budgets for grassroots organizations helping farmed animals are only ~a million dollars a year or less. It’s true that the budget for People for the Ethical Treatment of Animals (PETA) is bigger, and that of The Humane Society of the United States (HSUS) over a hundred million dollars. But compare these to the companies that exploit animals: in 2007, just two of these companies—Tyson and Cargill—had revenues of over $115 billion. Billion, with a “B”! Suffering is irreducibly bad, and thus eliminating suffering is the ultimate good. Every time we choose to do one thing, we are choosing not to do another. Reducing suffering is the ultimate good; and every time we choose to do one thing, we are choosing not to do another. From these two facts comes my first principle, my bottom line and guide: to eliminate as much suffering as possible. Everything I do derives directly from that; we make our choices based on which option will lead to the least amount of suffering. Of course, there is a lot more to discuss in terms of the hows and whys of optimal advocacy. Bruce Friedrich and I have distilled the lessons of our decades of activism and the insights of hundreds of other activists into our book The Animal Activist’s Handbook. Despite all the current horror and suffering, if we take the long view and are willing to devote our limited time and resources to the work that needs to be done, we should be deeply optimistic. If we take suffering seriously and are committed to optimal advocacy, we can each create real, fundamental change, every single day. Because of the number of individuals suffering and the reason behind this hidden brutality, I believe that animal liberation is the moral imperative of our time. We can be the generation that brings about this next great ethical advance. We should revel—really revel!—in the freedom and opportunity we have, the chance to be a part of something so profound! This is as meaningful and joyous a life as I can imagine. We have no excuse for waiting. Taking meaningful, concrete action for the animals doesn’t require anything other than our choice. You don’t need to start a group. You don’t need to pass a law. You just have to make the simple but profound and life-changing choice to be a part of this vital work. In the end, in our hearts, we know that regardless of what we think of ourselves, our actions reveal the kind of person we really are. We can each make the choice, right here, right now, to join together and dedicate our lives to a larger purpose, to maximize the amount of good we accomplish, to really change the world for the better.